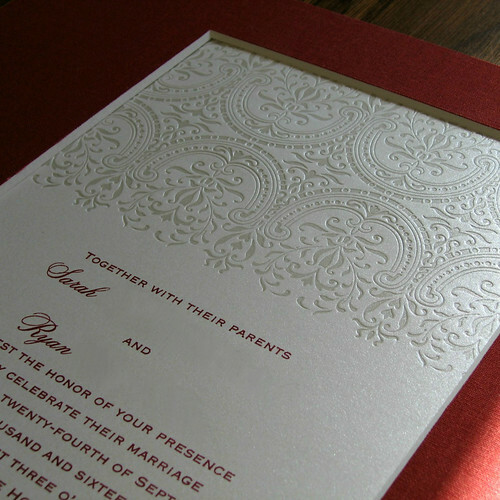 I mailed off this quilled wedding invitation mat last week... a commissioned gift for a couple who married in September. The wedding color palette was cranberry and sangria; the elegant pearl white invitation featured deep red lettering. The client requested a standard size mat as she planned to purchase a ready-made frame. 11 inches x 14 inches worked well for this invitation as it was a little larger than a standard 5 x 7-inch rectangle. Having a mat custom cut is more costly than a pre-cut mat, but there are far more color/texture options, not to mention the cut-out can be placed where desired. I positioned it so that the majority of blank space was at the bottom to accommodate the quilling. 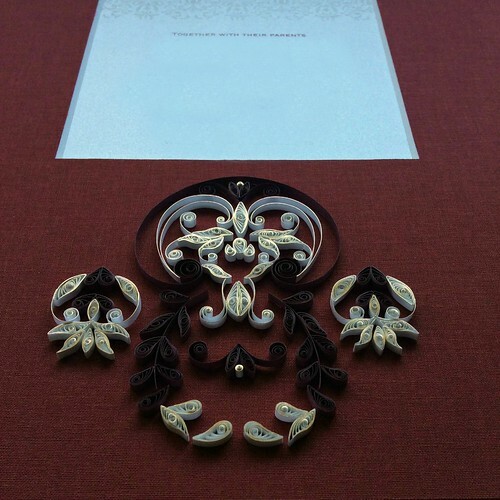 The invitation's debossed, symmetrical design is what I recreated... far from the easiest thing to do, but so beautiful I wanted to give it my best shot. 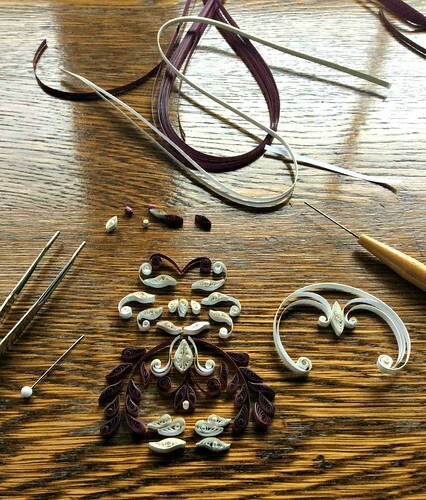 In addition to wine colored quilling paper, I used warm white strips with a gilded edge - shiny and elegant, they make any design extra special. I always count on my local frame shop to have just the right mat and happily, that held true this time. In fact, there was only one choice that was the perfect shade to coordinate the lettering and burgundy quilling paper. Also, it was a fabric-covered mat board - my favorite type on which to glue quilling. This in-progress shot makes me smile... it looks more like some sort of winged creature! Time to glue... the first thing I did was mark the center of the mat with tape just above where the quilling would be placed. Because the mat measured eleven inches across, my trusty six-inch ruler came in handy to make sure I was staying true to the center marker, yet it didn't get in my way as a longer straight-edge would have. There are probably a hundred ways to glue a scroll and ninety nine of them will look off-balanced. Measure, measure and measure again is always my motto when doing final gluing. Edited to add: If you are in search of tips on how to glue quilling, visit my Quilling FAQ page. 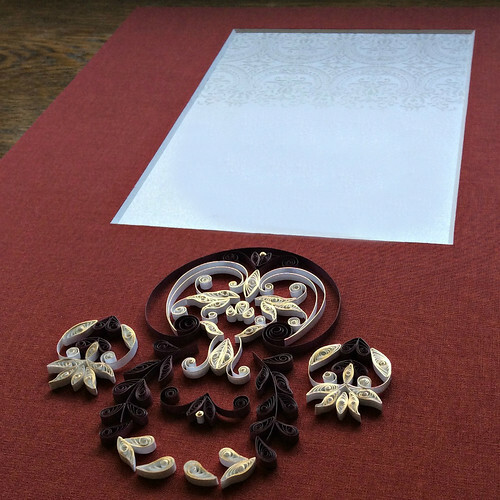 Have a look at more quilled wedding invitation designs. Beautiful and so elegant. When my daughter get married I will have to keep you in mind. I have indications that this may be in the not distant future. Very very pretty... I still have to learn how to glue these pieces without any glue marks left... Thanks so much...It would be great help if you can share a video showing how you gluedthese pieces...Also what kind of glue is best for this type of work. Thank you, LaVon, that's nice to hear. Thank you, Neeru. 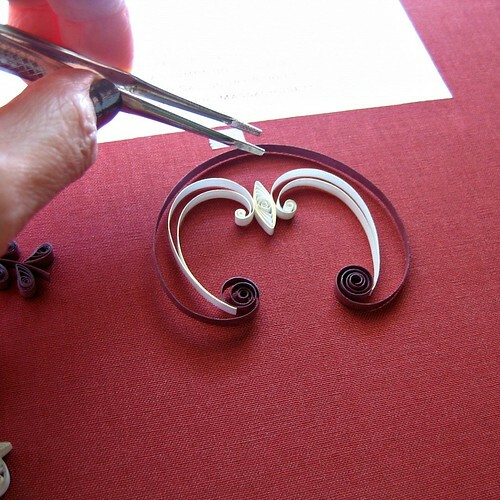 If you visit this link: http://www.allthingspaper.net/p/quilling-faq.html, I detail my gluing process. At the same link there is another to a video I made that shows how I glue quilling. Wow, your work is always so breathtaking! This is truly a work of art!! Aw thanks, Lenoria, that's so nice of you to say. It's elegant, as always. Your work surely speaks for itself. Thanks very much, Julie and Jens!